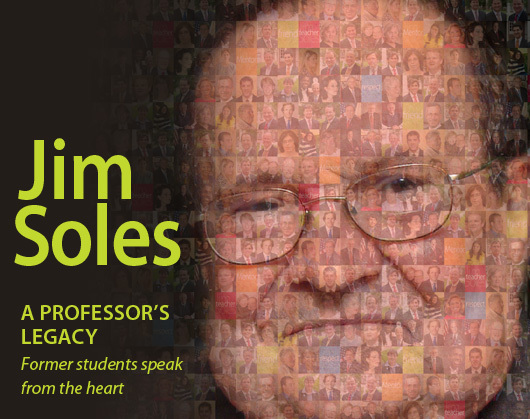 The late political science Prof. James R. Soles inspired countless students during his decades of teaching and mentoring, with many of those alumni going on to careers in public service thanks to his influence. Today, Prof. Soles’ legacy extends even to students who never met him, through the support provided by the Soles Citizenship Endowment. Journalist, nonfiction author and English Prof. McKay Jenkins has written What’s Gotten Into Us, a meticulously researched account of the potentially hazardous chemicals found in common consumer goods. Here, he summarizes some of what he learned about ways to minimize risk to ourselves and our families. When diners and restaurant critics rave about the student-run Vita Nova eatery on campus, they may not see it for what it really is—a laboratory for Hotel, Restaurant and Institutional Management students to learn the business. Take a behind-the-scenes look at students as they fill 17 different jobs at Vita Nova every day. Diana Eldreth grew up helping out in her parents’ pottery business, even operating a roadside stand with her sister at which they sold handcrafted “seconds.” Now, she and her husband, Whitney Chute, both 2000 graduates of UD, are continuing the family tradition by running the pottery that emphasizes creativity and quality.